my girlfriend virago has been a bit nervous about tornadoes. she moved here last year from san francisco, where "april showers" just means it rains every day, as opposed to here where it mean "massive thunderstorms and tornado watches". when the subject comes up, i generally reassure her that tornadoes almost never hit the city itself. 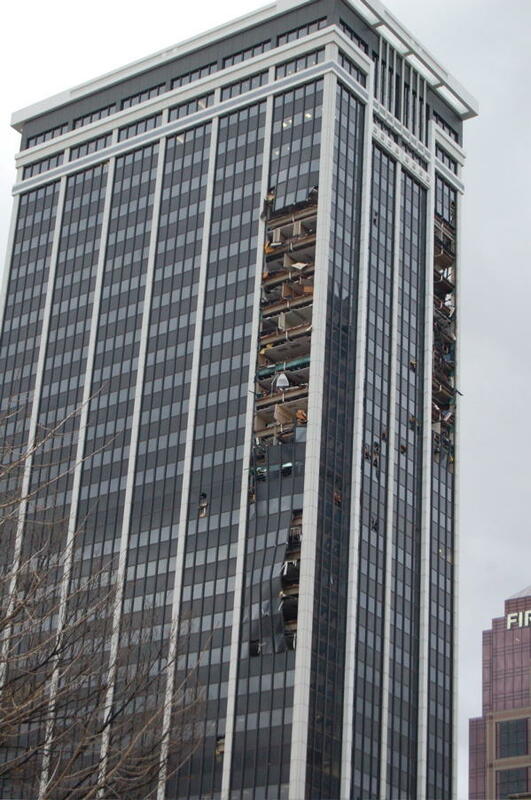 Tornado-like winds popped scores of windows from a high-rise building, but thousands of people celebrating the Final Four in Downtown Indianapolis escaped the violent storm virtually unscathed, officials said today. Mayor Bart Peterson called it "good fortune" that the NCAA championship was in town, because police, public works employees and others were all Downtown and ready to respond when the storm hit. 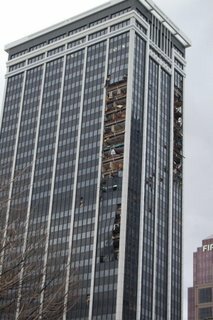 the storm did serious damage to the regions bank building downtown (aka one indiana square), as seen in this photo, by local photographer jeff bedel. Todd Maurer, one of the building's owners, said it is too early to know how much the repairs will cost. "It looks like a tornado to me," Maurer said. "The wind doesn't take out walls." some witnesses claim having seen a tornado, but this has not been confirmed (and probably won't at this point). 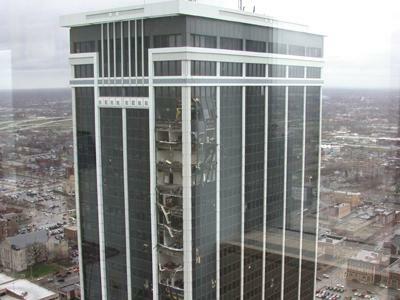 this could've been a major tragedy, as the ncaa final four is happening downtown this weekend. fortunately, there is no sunday night game, but the city did host a john mellancamp concert last night. the idea of a bunch of people at a mellancamp concert narrowly avoiding death by tornado sounds like an indiana joke waiting for a punchline, but it really happened, as reported by advance indiana. up at my house in midtown/south broad ripple, i heard the sirens go off and the storm was enough to interfere with my satellite reception, preventing me from catching the last few minutes of the sopranos and some of big love, but that was the worst of it. update: originally, i posted this photo, which i snagged from x-tra rant, who took it from WRTV-6, but i have replaced it with what i think is a better photo by jeff bedel. one more thing: the mellancamp concert was actually called my coke fest. that's right: my coke fest (photo gallery here). sorry, but when i hear the words "coke fest", i don't think of coca-cola.